This bright, extraordinary man has a developed imagination and creative thinking. The Dragon-Aquarius hovers above reality, not noticing the imperfection of this world. She strives for independence, she lives as she sees fit. According to the combined horoscope, the Dragon-Aquarius is an outstanding personality. It’s a dreamer, completely immersed in his fantasies. It is peculiar to be mistaken and disappointed, but not to see your mistakes. However, under the influence of the Dragon, the unpredictable Aquarius acquires a degree of diligence, discretion. People of this combination are famous for their inconstancy, suffer from mood swings, but they are resourceful and lucky. They trust their intuition, they come out of difficult situations with brilliance. A beautiful child, a visionary and a fabricator — this is the Dragon-Aquarius. The surrounding people note its main feature: the ability to enjoy life, no matter what. In a difficult situation, he is looking for salvation in his fantasies. Willingly thinks up entertainments and interesting activities that can distract from sorrows and misfortunes. Aquarius-Dragon trusts his intuition and is always right. Does not load his head with unnecessary problems, he lives cheerfully, does not deny himself the pleasures. In a word, it is an example of a happy person. However, periods of emotional recovery can be replaced by deep depression. Dragon-Aquarius — a contradictory personality, here there can be no question of permanence and certainty. People do not always understand the Dragon-Aquarius, do not approve of his easy, careless approach to life. At times, he causes envy, but most often irritation and anger. Although he treats people well, he tries to help all those in need. He is a kind, sympathetic and generous person. Without hesitation rushes to the rescue and does not ask for anything in return. Aquarius-Dragon needs friends, seeking support and understanding. However, he will not impose himself and ask for help. Long looks at people, not everyone opens his heart. Dragon-Aquarius is easy to communicate, cheerful and carefree, but at the same time judicious and knows how to stand up for himself. In everything follows intuition, therefore it is rarely mistaken and happily avoids troubles. Nature has generously endowed the Dragon-Aquarius with different talents, he can only find them use. He has tremendous creative abilities and extraordinary flair. He comes up with new, original solutions, often becoming a pioneer in his field of activity. Many consider him a genius and an unrivaled master of his craft. However, Aquarius-Dragon is lazy, slow, does not hurry with the embodiment of ideas in life. In addition, he is critical of his abilities, emotionally unstable and capricious. Aquarius-Dragon is rarely happy with his successes and wants to get more than fate gives him. For complete happiness, he lacks inner peace and tranquility. Restless Aquarius-Dragon is greedy for new sensations, is in constant search of its ideal. And the process of courtship gives him more pleasure than the final result — a conjugal union. According to the love horoscope Dragon-Aquarius — sublime nature, romantic. Arranges bright, unforgettable dates, and never repeats. His rich imagination finds a way out in unexpected acts. It can be hot-air ballooning or scuba diving. Aquarius-Dragon can not be called a good family man. The need to solve everyday problems leads him into depression: he is afraid of losing his inspiration and motivation to work. It is much more important for him to have a favorite affair than domestic chores. Dragon-Aquarius needs a strong partner who will understand his desires. He will gladly give way to the role of leader, and he will indulge in dreams and carelessly plow through life. The Aquarian-Dragon is amorous, emotional, not faithful, but it is not boring with it. This person can not be called an industrious and responsible worker. His path is creativity, not physical labor. Aquarius-Dragon possesses artistic talent, developed imagination and rich imagination. He likes to be in the center of attention, he should hear the audience applause. Usually people of this combination choose professions related to art. Although intense creative work can negatively affect their mental health. Restless Dragon-Aquarius is hard to sit in one place. Do not consider it necessary to adhere to a strict schedule, may be late for work. Too enthusiastic about his ideas to delve into the workflow. In every way avoids responsibility. Therefore, it is difficult to imagine him as a leader. In addition, not too interested in material compensation. Dragon-Aquarius will leave a prestigious position with a high salary, if you do not enjoy the work. An Aquarius man, born in the year of the Dragon, sets specific goals, but does not deny himself the pleasure of going to them in a roundabout way. Likes to fantasize, is fond of mysticism. In everything he tries to find a hidden, mistic meaning. He considers himself entitled to influence the fate of people. His advice and recommendations can be useful in solving complex problems. But he diligently avoids the participation of other people in his life. Do not even try to understand the intricacies of his thoughts: the man Aquarius-Dragon simply needs to be trusted. In love, he is looking for inspiration, he needs a stimulus for decisive actions, and he does not have the willpower to take it. Be sure to achieve the reciprocity of the most impregnable beauty. For the Aquarian woman born in the year of the Dragon, personal interests are of great importance. This gifted personality dreams to own take place in life. She has great abilities, if she wishes — she can succeed in any activity, but she gives preference to creative professions. An important role is played by her positive attitude, the desire to enjoy life. 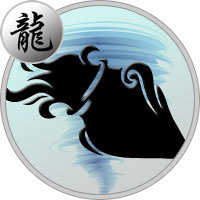 Woman Aquarius-Dragon often neglects the attention of fans, is afraid of losing their freedom, so do not hurry with marriage. But over time it can become an exemplary mother and wife, like any woman, needs support. Often behind a cheerful air you can see doubts, hidden anxiety.